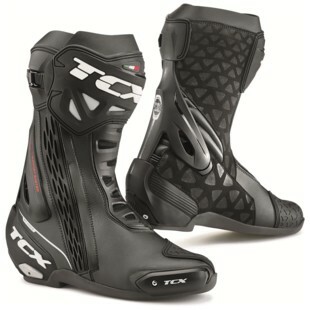 As an upgrade of the perennial favorite S-R1 boots, the new TCX RT-Race Boots raise the bar and come gunning for Alpinestars and Dainese. A very welcome increase in protection means that we go from good street sport riding boots in the S-R1, to mid-level track day boots in the RT-Race. There is not much that carries over from the S-R1 boots, and the RT-Race boots are a ground-up redesign that borrows some features from the top-dog RS-2 Evo boots. The standout protection feature here are the DFC (Double Flex Control System) and the FFC (Fasten Fit Control) lacing system. DFC is external bracing attached to the microfiber upper that only allows lateral and longitudinal movements within physiological limitations, while preventing excess torsion and minimizing risk of injury. The Fasten Fit Control is an internal speed lace booty that provides torsional protection, while the outer shell of the boot houses the toe, heel and ankle armor that handles impact absorption. The external sliders are removable for easy replacement after some toe dragging at the track. 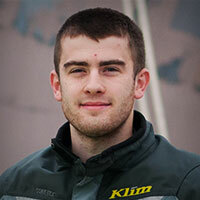 The addition of a soft-touch microfiber gaiter at the top of the boot and an Air Tech breathable inner mesh liner contribute to making the RT-Race Boots something that can be worn all-day on the bike at the track or on the street. It might not look like it at first glance, but the RT-Race Boots eliminate the need to have different street and track foot wear. Now, the same boots can be used in both environments, bringing new meaning to trickle-down technology from racing.